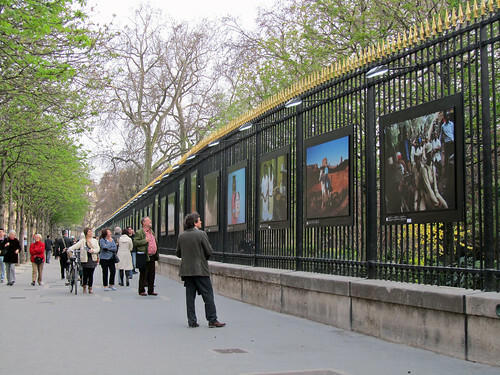 From time to time, photo exhibitions are held along the fence of Jardin du Luxembourg. In conjunction with International Women’s Day a couple of weeks ago, the French Senate together with Olivier Martel brought forth “Femmes Éternelles”, an exhibition of 80 portraits of women from all over the world, with scenes from daily lives to ceremonial events. I have been over to look at them a number of times at this stage. What can I say? I really like them. One particular photo that touched me most is that of mother and child in hospital, taken in 1987. The baby was living inside a bubble and yet laughing so joyously, a look reflected in the mother’s visage, despite what must have been poignant that she could not yet held her baby close to her without the barrier but keeping her morale high that this would be the good start the child needed. It is a powerful image, even if not as colourful or exotic as other shots of the series. The exhibition runs until 15 June 2011, and if you can’t make it to Paris between now and then, you can still enjoy the photos from Martel’s website. Which photo inspires you most? Day 80: Fontaine de l’Observatoire Day 82: Gasp, wide eyes!